The V League returns, 2014! The 2014 V League season is due to start in just over a weeks’ time. A fact i’m rather excited about! This year’s league with consist of 13 teams. The league has lost Kien Giang due to a lack of funding, along with last season’s acrimonious departure of Xuan Thanh Sai Gon. However, I’m rather excited to see how the three promoted sides fair; 2013 VLeague 2 champions QNK Quảng Nam, runner-ups Than Quảng Ninh and Hùng Vương An Giang. Current champions Ha Noi T&T will host Becamex Binh Duong in the opening match. A full list of the opening days fixtures can be found here. The season is due to start in March 2014. Hà Nội T&Ts march towards continental glory! The expansion of the Asian Champions League for 2014 means for the first time since 2010 Vietnam will have a representative in the qualifying stages. To qualify for the group stage T&T will have to overcome three ‘away’ ties (these qualifiers are not over two-legs and the highest ranked associations teams are given home advantage); firstly against Pune FC of India, then Muangthong United of Thailand and finally away to Melbourne Victory. It seems a bit tricky. 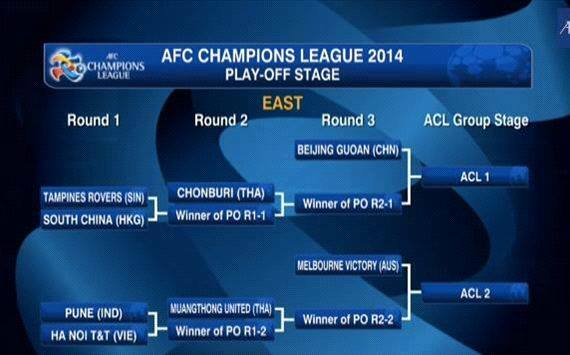 If at any stage Ha Noi do suffer a surprise defeat all is not over as the team will drop in to the 2014 AFC Cup! The continental cup features the lower ranking national associations; Indonesia, Maldives, Hong Kong, Singapore, Iraq, Oman, etc. With the draw already made Ha Noi T&T will, if they lose in the CL, face Arema Indonesia (Indonesia), Selangor (Malaysia) and Maziya S&R (Maldives). I had been harboring hopes of following T&T throughout their continental matches but being drawn away in India is somewhat out of my budget. For weeks I’d joked among friends that I’d be off to the Maldives for a luxury holiday to watch T&T on their travels, and having potentially been pitted against Maziya the joke now seems to be on me! How do you get from Hanoi to the Maldives on a budget? I’d recently been having coffee with T&T’s experienced attacker Bao Khanh who shared many experiences of the Maldives; taking boats to various islands for training sessions on previous trips and tellingly me great stories of crystal clear waters. However, before all the excitement of the domestic season and continental cup drama, this Saturday sees reigning league champions Hà Nội T&T travel to Ninh Binh to take on the 2013 Cup holders in the 2014 Super Cup. Both sides will give their new signings a run out, with Hà Nội T&T’s new midfielder Hector (signed from SLNA), defenders; Gruica (signed from Dugopolje in Hungary) and Gallagher (unattached from Aus) all expected to be in attendance. One notably absentee from last season success will be club captain Cristiano, who has brought his long playing career to an end. He has featured in each of the last 4 seasons ‘team of the season’ and is regarded by many fans as the first footballing legend of Ha Noi T&T. A nice guy too. Exciting stuff; unfortunately now that I’m working weekends I won’t be able to accompany you to many games but I look forward to reading all about the new season. With the team playing in the AFC Champions League and potentially the AFC Cup the schedule looks like it may work in your favour, early reports are suggesting a fair few midweek games,i’ll keep you posted!